The other question, beyond what the master narratives are, is the matter of who is driving that message? Are journalists themselves the source for these master narratives? Are the campaigns controlling the message directly, through the candidate? Is it coming from campaign surrogates, in campaign control but at arm’s length? To answer this, the study examined the source of each assertion studied about the candidate’s personal qualities. The answer is that in 2008, the candidates and their campaigns were driving the message more than any other source, with journalists themselves close behind. Overall, roughly four-in-ten (39%) statements studied came from the contenders themselves or their surrogates. The press was almost as prevalent a source for these master narratives, with 36% of the statements coming from journalists or talk show hosts. Other groups shaping the campaign narrative were not heard nearly as often. Voters, for example, made only 6% of the assertions counted in this study, the same percentage for people considered independent experts. And 4% of the assertions about these personal narratives about the candidates originated from poll results. In Clinton’s case, much of the coverage she wanted to get across came directly from her campaign. 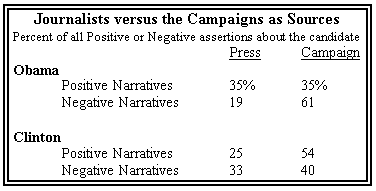 Fully 54% of the positive assertions about Clinton came from either a candidate or a campaign surrogate—by far the most control over positive message of any of the major candidates studied, and twice the percentage driven by journalists themselves (25%). In the case of the most prominent narrative about her—her preparedness—the campaign was three times more likely to makes the case than was the press (49% to 17%). Interestingly, almost all of these campaign assertions came from unnamed surrogates, meaning that the press was ferrying positive spin about Clinton anonymously from her own people. This might suggest that Clinton had to press her case because journalists wouldn’t do it for her. But it isn’t that simple. Journalists played a large role in refuting one of the most important criticisms about her character, the argument that she is cold or hard to like. Fully 40% of the assertions rebutting the idea that she was unlikeable came from journalists themselves, and another 7% came from talk show hosts. That combined number (47%) is more than the amount that came from the Clinton campaign (39%). Many of these assertions—that Clinton was, in fact, likable and personable—were made around the time of the January 8 New Hampshire primary when Clinton became visibly emotional when asked during a campaign stop how she is able to maintain an upbeat attitude during the difficult campaign. Many journalists analyzed that this moment showed a different side of Clinton, one that was more personable and connected with voters in a way that had not previously been the case with her. The Obama campaign itself was not driving the positive picture of its candidate as directly as Clinton was. Overall, just over a third of the positive personal master narratives about Obama came from his campaign (35%), the same number that came from journalists. In this case, the Obama campaign drove some of the positive messages and journalists drove others. When it came to arguing that he represented change, for instance, Obama had to make that case himself. Fully 40% of those assertions came from him, and another 12% from his surrogates, versus 20% from the press. But when it came to the idea that Obama was a candidate of exceptional charisma, the press was far more likely to state that on its own. Fully 47% of the assertions about Obama’s charisma came from the press. Another 9% came from voters. In trying to defuse the positive narratives about Obama, on the other hand, the rival candidates themselves did much of the heavy lifting. In refuting both the idea that Obama had exceptional charisma and represented change, more than six out of 10 assertions came from rival candidates. The candidates themselves also played a major role in trying to argue that Obama lacked the experience to lead. Here 44% of this narrative came from rival candidates, largely Clinton, while journalists represented 15%. Was the press less willing to raise those doubts itself, given that Obama was winning primaries and caucuses or because of their own views? Or did the willingness of rival candidates to cast those aspersions about him make it unnecessary? That is harder to pin down. For McCain, the positive narratives about his character, history and leadership came fairly evenly from both his campaign and the press. In all, 32% of the affirmative or positive assertions about McCain came from the candidate or his campaign surrogates, roughly split with the 34% of those assertions that came from the press. Journalists were a strong voice—albeit a conflicting one—on the two ideologically driven themes about McCain. Their strongest presence was in criticizing his ideological underpinnings. More than a third (34%) of these claims came from journalists. And, the ever-opinionated talk radio hosts accounted for another 22%. 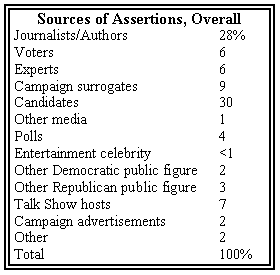 In all, then, 56% of the skeptical assertions about McCain’s conservatism came directly from the media. The flip side was also true, however. Journalists’ voices were also strongly present in the image of John McCain as appealing to moderates. In this case, nearly half (46%) of such statements came from journalists (41%) or talk show hosts (5%), versus a mere 15% from the McCain campaign.